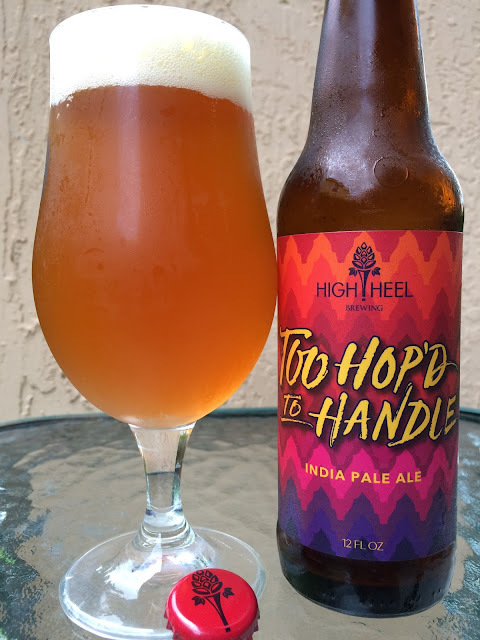 Today I'm checking out Too Hop'd to Handle India Pale Ale brewed by High Heel Brewing in Lakeland, Florida. The label is very colorful, a nice pattern, but what I like most about it is the quality of the material. Not your standard paper label that gets all messed up with packaging, transit, water. Too Hop’d to Handle is crafted with Columbus, Mosaic and Simcoe hop varieties according to their website. The label, however, says four varieties. Oh wait, that other hop is some secret rotating unnamed weapon that is going to blow us away with some seasonal hop variety! Belgian Candi Sugar is also added as an embellishment in the brewkettle. 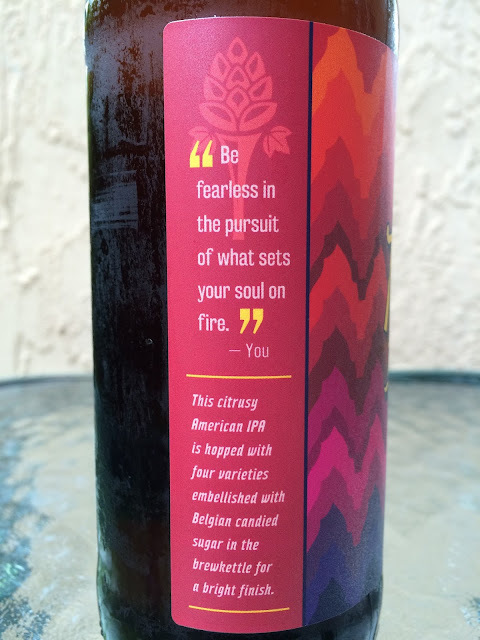 The label further quotes "YOU" by reminding you that you said to "Be fearless in the pursuit of what sets your soul on fire." You were drunk! I know you don't remember saying that! What the label doesn't tell you that this is an 8.4% alcohol, 89 IBU beer, and that's precisely why your quotes had to be recorded. Nice tropical pineapple and sweet citrusy aroma. Sugary flavors out of the gate meet citrus tangerines and more tropical fruitiness. Some lemon and grapefruit bitter balance follows. And the finish to each sip carries all that! There is some definite Belgian character with the added sugar. It's pretty sweet but trails off and balances with the hops in each sip. I'd say the addition of the Belgian Candi is very interesting and innovative, though I'm not sure I love it. I'd definitely like to check out the base beer as the underlying aroma and flavors are great! Oh, and 8.4% alcohol? That part was hard to remember especially since it wasn't on the label, but I'm guessing you catch my drift? Definitely a beer to drink before going to a disciplinary meeting with your kid's principal!